Good morning! Well, the sun peeked out yesterday late afternoon – long enough my parents decided to have a cookout – half way through THAT it started raining and overnight we had more. This morning it’s so steamy outside it’s hard to BREATHE! Do you suppose we will EVER EVER EVER stop complaining about the weather? Seems my blogs are full of complaints all the time….sigh. Happy sunday to you , Sammy ! HAHAHAHA………kinda hard to tell though isn’t it Charlie? I’m surrounded by gingers in that photo. Mom thought it was pretty funny that I got up on the back of the couch in her studio to post with that IMPOSTER! There’s nothing like the real thing, Sammy! I’m with you on that Sparkle…..impawsters may come and go but there’s only one ME! Indeed…….there may be “pretenders to the throne” but only one little royal ginger boy in THIS house!! Oh, Sammy: you’re the ONLY one! Gosh…..thanks for saying that Sundae….with all these “fake gingers” around, I don’t want anyone to be confused – there’s only one cat in that photo that gets bacon today!!!!! YOu are there looking soft and warm and huggable and kissable too! You should check my post today, it’ll make you rethink the “cuteness” concept about ginger cats. Take care Pam, Sam may be up to something ! You are so hilarious…..I simply could NOT stop laughing…..but I do have to say that I’ve crossed “take a cruise with Sam” off my bucket list. Permanently. Loved the post Leo you crazy boy you! Of course, there’s no mistaking the real Sammy!! But the one you’re sharing the back of the sofa with looks as if it was patterned after you…a very good imposter! We can tell the difference because that one doesn’t have bacon breath! Oh that’s right! I’m always going to be easy to pick out from a crowd of gingers due to my devotion to bacon! Thanks for reminding me! And here I thought you were an “only cat”, Sammy. Turns out you are one of triplets! 🙂 Well, you are by far the best looking cat of the bunch! Gosh thanks! That makes me feel better…..I was starting to think the competition was getting an EDGE on me! Only one Sammy Cat and I bet those imposters don’t have extra toesies! We have sun but it seems to be playing hide and seek………remind me later this coming week that I complained about rain will ya? We’re heading to 100 degrees mid-week. YEEKS! I see you Sammy. I love ginger kitties. I have two that let me live with them.Hope your got some sunshine. Oh what a NICE thing to say Savvy! Well I was hoping to blend in with the other gingers so Mom wouldn’t see me (playing hide and seek) but sure enough – she spotted my extra toesies and knew it was ME! What a cute and good picture Sammy! I really like the ideas above the couch. A hanging shelf with lots of items to make a display with, and a picture above it. Not a bad little idea! Your mom must’ve done that, right Sammy? If she did, that’s a really neat idea! 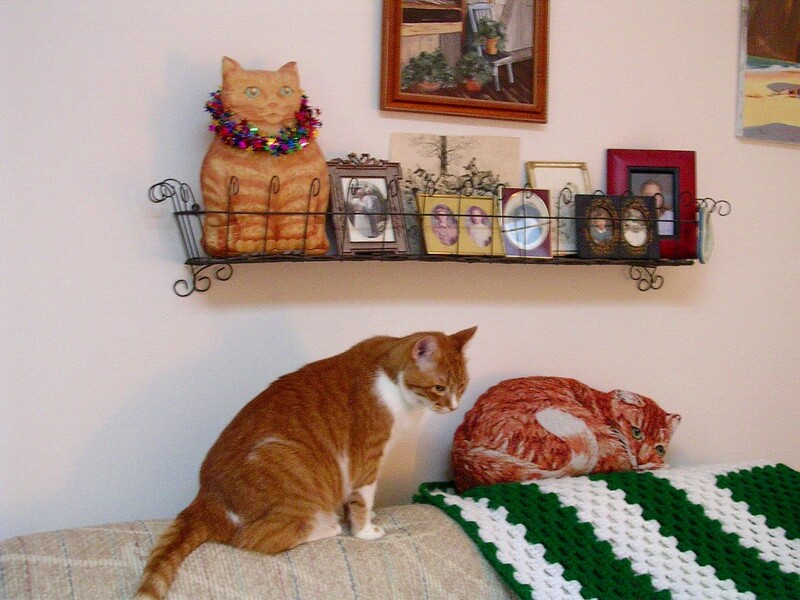 Yes it was Mom’s idea – it’s a little shelf in her art studio at home……odds and ends (and one ginger cat!). Yea, I found you in the picture earlier today. Nice way to blend in with your “friends”. Not a bad thing to place in an art studio anyway, Sammy! That’s cuz the REAL Sammy’s “in town” and keeping an eye on him! WHEN DID THEY CLONE YOU ??? I tell ya Nissy if you sit still long enough SOMEONE will clone you so STAY ON THE MOVE BUDDY! Awwwww……….well thanks for that! I do try to be cuddly – especially compared to a pillow! Now if the pillows had fur on them – well – we might have a “toss up” !! There is only one Sammy. Accept no substitutes! Nothing like the genuine article huh Miss Layla??!!! I do kinda stand out in a crowd of gingers don’t I??!! Well I’m glad I’m the most cuddly of the crew anyway……….I hope you have a grand week too…..at least there’s no big RAIN scheduled for any of us – just HEAT HEAT and MORE HEAT! BOL there are so many you’s!! There are aren’t there?! Confuses even ME and I’m one of the “many” !! Love those other Sammy cats but we KNOW you are the ‘real deal’ sweet boy!!! I know…..and I’m hoping she bounces back yet again from this latest bout with her chronic illness…..poor girl. Sammy and I have our paws crossed too…..both of you truly have “been through the wringer” haven’t you…….bless your hearts.